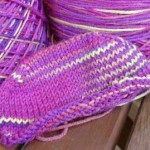 I got very lucky in how well the heel color matches the pink in the variegated. I picked that up on Thursday at Pins and Needles in Princeton. They have a great selection of Koigu and Kersti. Can you believe that’s the only yarn I bought there that day? 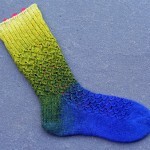 How Do You Knit Socks? mmmmmmmmm knitting on the beach at sunset with a slight breeze and warm air. 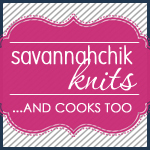 mmmmmmmmmmm…..
i am going to the Bahamas in August, I am packin my knitting! Don’t you love date night? Michelle and I went out for dinner and a movie on Friday- so fun! 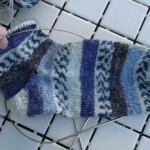 I love it that your positives and negatives both include thoughts of knitting — naturally! Kevin and I looked in Hoboken when we were first married. It is a fun city. I hope you find the right town. Being a NYer, we grew up with an attitude against Jersey but Kevin has shown me a whole different side.